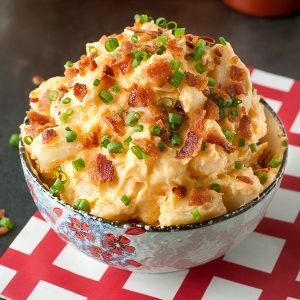 Spice up your Spring and Summer barbecues, picnics, and parties with this zesty Bacon Sriracha Potato Salad! This feisty side dish is loaded with flavor! Peel potatoes and chop into 3/4-inch cubes. Place potatoes in a large pot and cover with cold water, about 1 inch above the potatoes. Set burner to high and bring water to a boil. While you wait, line a rimmed baking sheet with parchment paper and top with 3-4 slices of bacon. Set oven to 400 degrees F and place the baking sheet inside (no need to pre-heat) on the center rack. Bake for 20 minutes until crispy and golden. Alternatively you can fry the bacon if you prefer. Drain potatoes and move to a large mixing bowl. Add salt and vinegar and combine gently with a rubber spatula/bowl scraper. Allow to cool slightly, letting the potatoes sit for around 15 minutes. Combine mayonaise, sour cream, and sriracha chili sauce in a small bowl. Once the potatoes have cooled a bit, fold in using the rubber spatula. If you'd like spicier spuds, feel free to add extra sriracha to the mix. Made as written, the recipe is zesty but not quite face-kicking spicy. I'll leave that up to you! Mwah! Top with crispy bacon, chopped green onion, and paprika and serve at room temperature. Serve alongside your trusty bottle of Sriracha so anyone willing to walk on the wild side [it's delicious!] can turn up the heat with a little extra kick! I use the America's Test Kitchen method for prepping my potatoes, since it's never failed me and always yields perfect results, if you're a potato salad making pro and have a technique you adore, go for it! For best results, grab red potatoes for this salad, their buttery texture is perfect for potato salad and they hold their shape even after little manhandling to fold in the sauce. Russet potatoes will also work, but will smush and crumble a bit easier. To make this paleo or dairy-free, simply swap the sour cream for extra mayo and you're good to!